It’s a KNOCKOUT for BBVs and STIs at Dubbo! 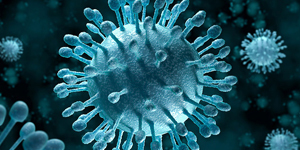 Is a hepatitis C vaccine the key to eradication? The annual HARP (HIV and Related Programs) Forum was held 23-24 October in the Kerry Packer Education Centre in Camperdown, Sydney. It was well attended by staff from the Ministry of Health, all Local Health Districts, Justice Health & Forensic Mental Health Network (JH&FMHN), and community based NGOs, working across the viral hepatitis, HIV and STI sectors. In the opening session, CEOs and directors from ACON, NUAA, Aboriginal Health, Hepatitis NSW, Positive Life NSW, SWOP and Multicultural HIV & Hepatitis Service shared their thinking on the opportunities and challenges for affected communities today and in the coming years. 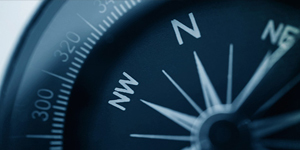 As government and non-government organisations work towards ending HIV in NSW by 2020 and the elimination of hepatitis C by 2028, the challenges are many and complex, but the opportunities provide pathways ahead to meet these goals. Apart from the paramount need for ongoing and sufficient funding, chief among the opportunities are the strong partnerships that exist among the communities living with or affected by these health conditions, the NGOs working on their behalf, and the NSW health workforce that provides clinical and health promotion services to help address the communities’ needs. Stuart Loveday, CEO of Hepatitis NSW described some of the strong existing partnerships as we strive for elimination of hepatitis C in 10 years’ time, focussing on those which could benefit from further strengthening. Stronger partnerships between Hepatitis NSW, the 15 geographical Local Health Districts (LHDs) and the statewide JH&FMHN will see enhanced service delivery for people with hepatitis C and living with hepatitis B. We look forward to our annual planning meeting with the HARP Managers that will help guide this collaborative working. There have been some fantastic examples of this closer partnership approach, including Hepatitis NSW’s recent work with the Western NSW LHD and the local Primary Health Network to enable many Aboriginal people in the central western NSW area to undertake HBV testing. Also, our partnership with ACON and SWOP and local nurses at the recent 48th Koori Rugby League Knockout in Dubbo resulted in many people being tested for HBV, HCV, HIV and a range of STIs. In the drive to eliminate HCV among people who inject drugs or might be likely to inject again, the new formal partnership between Hepatitis NSW and NUAA (NSW Users & AIDS Association), is an integral part of our key performance indicators (KPIs), and will see our two organisations work more closely together to ensure wider coverage, and that no duplication of services occurs. What is clear is that community based education and peer based work to raise awareness and help mobilise people attending drug health services to access treatment and cure, are best done in close partnership with locally based clinical services. These services are where many people with hep C are already accessing healthcare in one form or another. In this partnership model, nurses from the LHD are on hand, at the same time as peer workers are present, to work through the clinical components of testing and treatment with the person with hep C attending OST, NSP and residential rehabilitation services. Far better outcomes, in both uptake and quality, are achieved when the community and clinical aspects of the short journey to cure take place in that one service and at the same time. Hepatitis NSW will soon agree an action plan for Test Cure Live, the new initiative from Hepatitis Australia with funding from the Australian Government Health Department to work to raise awareness of the new DAA treatments and help mobilise into treatment and cure those tens of thousands of people who contracted hep C through sharing drug injecting equipment many years ago and may not know they have hep C. Test Cure Live also aims to reach the ten per cent of people who contracted hep C via blood-to-blood contact through means other than drug injecting. Without a doubt, while collaborative partnerships have always been a mainstay of the responses to the viral hepatitis epidemics, the way forward to elimination of hep C and hep B is to ensure respectful, collaborative and formal partnerships are enhanced. Marivet is a pan-genotypic regimen listed on the Pharmaceutical Benefits Scheme on 1 August 2018. It is not renally excreted and is the first pan-genotypic treatment option for people with renal (kidney) impairment. This pan-genotypic treatment was approved by the Therapeutic Goods Administration and is expected to be listed on the PBS, in 2019, for the treatment of people who did not respond to a first-line DAA regimen. The date of PBS listing is not yet known. New recommendations for the management of people who do not respond to DAA therapy have been added. Recommendations for the management of people with HCV and renal impairment have been updated. The statement was prepared by an expert panel representing the Gastroenterological Society of Australia (Australian Liver Association), the Australasian Society for Infectious Diseases, the Australasian Society for HIV, Viral Hepatitis and Sexual Health Medicine, the Australasian Hepatology Association, Hepatitis Australia and the Royal Australian College of General Practitioners. The annual NSW Koori Rugby League Knockout is the largest gathering of Aboriginal people in the calendar year, attracting 106 Rugby League Teams and over 22,000 spectators. The Knockout is seen as a modern-day Corroboree, a time for gathering, celebrating and reuniting with family and friends from all over the state. 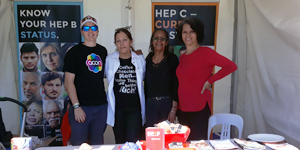 Hepatitis NSW, ACON and SWOP (part of the “414 Close the Gap” partnership) shared a stall at the game and were able to have a yarn about health with hundreds of attendees, handing out thousands of resources and condoms. In the lead-up to the Rugby League Knockout the same 414 Close the Gap partners joined Bila Muuji Aboriginal Corporation, Western NSW LHD and Dubbo Sexual Health to run a health promotion and health education event. Aboriginal people who attended were able to engage in conversations, share a BBQ lunch, and find out more about viral hepatitis, HIV and STIs. People who were interested in testing on the day, could see one of two Aboriginal health practitioners from Dubbo Sexual Health who provided a private and confidential opportunity to undertake screening. The BBQ also attracted local businesses, such as the CEO and staff from the Dubbo Local Aboriginal Lands Council who were very supportive of the event. Western NSW LHD also held an Aboriginal Women’s Health Forum to continue the 2018 NAIDOC theme of “Because of her, we can!” as a primary contribution to the knockout weekend. The focus for the day was to promote inspirational women from local areas by facilitating a series of presentations providing attendees with an opportunity to interact. Our Aboriginal Project Officer Kerry Walker was given the opportunity to tell her story and her role at Hepatitis NSW, including the work she has done in this sector over the past decade. Hepatitis NSW shared a stand at the event with the Western LHD Aboriginal health worker, further demonstration of a positive, effective and sustainable partnership. The Reform on Drugs “Fair Treatment” campaign was successfully launched to a packed Town Hall on 12 October. Attendees heard why treating drug use as a medical concern, not as a criminal one, is an important step in changing Australia’s response to this social issue. 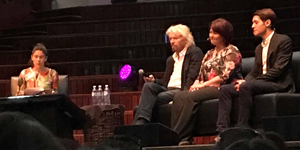 Sir Richard Branson (a long-time supporter of these aims worldwide), Dr Marianne Jauncey (director of Sydney’s Medically Supervised Injecting Centre (MSIC)) and Dr Khalid Tinasti (Executive Secretary on the Global Commission on Drug Policy) took the stage for the launch which was hosted by Jan Fran (presenter on SBS current affairs show “The Feed”); three videos shown, featuring people affected by current drug policies, strongly illustrated the need for change. Hepatitis NSW supports this campaign and is a partner to it, along with other Australian state and territory hepatitis organisations. Apart from the stigma and needless suffering caused by existing policies, it is our position that the current punitive framing of injecting drug use as a “criminal issue” makes it more difficult to not only prevent the transmission of blood borne viruses, but also to locate, treat and cure people living with hep C.
It would take 500,000 steps to walk from Dubbo to Sydney, the distance a person in regional New South Wales might travel just to reach the drug treatment they need. The Fair Treatment campaign is using The Long Walk to highlight the need for a new path for drug reform. Starting in Dubbo on 19 October, over 100 people have been walking from Dubbo to Sydney to deliver a policy document calling for care and treatment to be brought closer to home for people in rural NSW. People in local communities along the route of The Long Walk will be able to add their signature to the campaign and hear from those affected by current drug policies. The walkers will arrive in Sydney on 2 November and will hand the Long Walk to Treatment baton over to NSW Parliament House. Hepatitis NSW urges everyone to add their name and support this this important cause.